One of the things we love most about living in Arizona is the fact that we live next door to lots of beautiful and unique local wildlife. Arizona’s desert environment is home to an amazing array of biodiversity among mammals, arthropods, reptiles, birds and more. Deer, bighorn sheep, jackrabbits, and foxes are just some of the animals that call Arizona home. However, there are some less friendly four-legged neighbors that can quickly become a pest problem for Arizona homeowners. Animals are considered pests when they start to compete with their human hosts, or pose a danger to humans or other animals. While most wild animals tend to stay well away from human interaction and thrive without human interaction, some pest become accustomed to humans and can even become dependent on them – and that’s where the problems start. In this blog post, we will outline some of the most common rats and mice that we encounter on the job, as well as how to identify them and the damage they will do to your home. Woodrats, or pack rats, are common in central Arizona. There are actually three species of woodrat in central Arizona: the whitethroat woodrat, Mexican woodrat, and Stephen’s woodrat. They are relatively large, 6-8 inches long, and can be identified by their fur-covered tails and white underbelly and feet. They are nocturnal, and are attracted to bright and shiny objects. Woodrat nests are distinctive and conspicuous, and are usually constructed out of sticks, cacti, and organic debris. They’re most common in desert plant communities among juniper, chaparral, and desert scrub. However, they will also build nests in attics, underneath houses, or in abandoned vehicles. Woodrat nests are often used by many generations, and some have been occupied for up to 1,000 years! Woodrat nests can be hazardous to the health of humans and other animals because their communal living and storage areas are paved with layers of urine and feces. They have a varied diet, and often steal produce from gardeners, or eat the heads of flowers. They also like to gnaw on electrical wires, garden hoses, drip irrigation tubes, and AC or pool pump wiring. Roof rats are a non-native species that began showing up in Arizona in the early 2000’s. They’ve become successful in our area because of the warm climate and abundance of food. They thrive in old-growth citrus trees, mature landscaping, and near irrigation canals. Roof rats are similar in appearance to woodrats and Norway rats, which can lead to misidentification. The most distinguishing characteristic of roof rats is their long tail, which is hairless, scaly, and longer than their entire head and body. 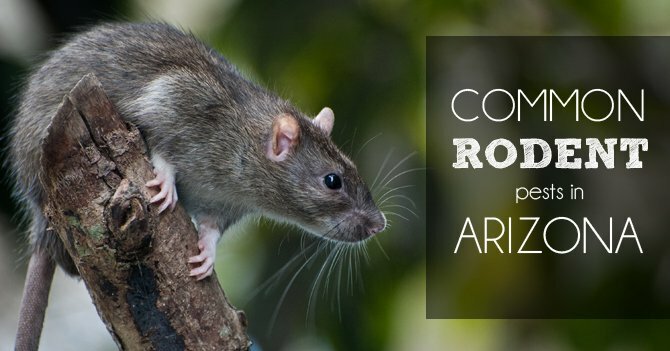 Roof rats are 7-8 inches long, with blackish fur and lighter underbelly. Roof rats, like woodrats, are nocturnal. They prefer to do most of their foraging in elevated areas both indoors and outdoors, and like to climb among trees, vines, rafters and wires. They often use utility lines to enter buildings. Roof rats can contaminate and eat stored food, gnaw on wiring and tear up insulation to use as nesting material. They also carry diseases such as murine typhus, leptospirosis, salmonellosis, rat-bite fever, and plague, which they can transfer to humans. They also eat the bark of trees, and can girdle and kill them. A good sign of roof rats in your home is dark smudging on surfaces from oil and dirt rubbing off their fur as they move around. Look for these smudges up high among the rafters of your home. Since they live overhead, you are less likely to see tracks, urine or droppings. Related: How do I get rid of roof rats? Norway rats, like woodrats and roof rats, are nocturnal. They are incredible acrobats, and can climb up and down pipes, jump up to 3 feet vertically, and have been known to jump 8 feet horizontally. They are one of the larger rat species here in Arizona, measuring 8 to 10 inches long. Their tails can be a good identifier: they are shorter than the length of their head and body, and are scaly and nearly hairless, with darker coloring above and lighter coloring below. They are brownish-gray in color, with a lighter underbelly. These rats usually nest in underground burrows next to foundations or under debris piles. Norway rats eat only a few ounces per day, but contaminate much more food than they eat. They have excellent gnawing capabilities, and can chew through almost any material, including lead, cement, insulation, electrical wiring and pipes. This propensity can cause tremendous structural damage to a home. House mice have been used to living with humans for thousands of years. This makes them a common pest in houses and outbuildings, as they depend on their human counterparts for shelter and food. House mice can be distinguished from rats by their smaller size. While they are similar in appearance to juvenile rats, they have smaller heads and feet. They are usually ma dusty gray color, with a cream-colored underbelly. Mice are mainly nocturnal, and they are inquisitive, social animals. They typically eat 1/10th of an ounce of food per day, but they are capable of contaminating much more than they eat. One mouse can produce 50 droppings per day. Adult mice can gain entry into a home through an opening .25 inches or larger. Once inside, they prefer to nest in dark, secluded places with ample nesting material – fabric, cotton, packing material or insulation. While they can damage your home in their search for nesting material, the main danger of having mice in the home is their ability to spread disease. House mice can transmit salmonella in their droppings, as well as tapeworms, rat-bite fever, infectious jaundice, plague, Hantavirus, and possibly poliomyelitis (polio). If you suspect a rodent problem in your home, be sure to contact us as soon as possible to limit the damage they do to your house and your health. Blue Sky uses an IPM (Integrated Pest Management) approach in the control of rodents. After a thorough inspection we are able to assess what treatment will work best for the given situation.